DIE Lunæ, 4 die Februarii. Precedents concerning H. C. desiring Conferences about Proceedings upon Judicature by the Lords. Conference to be had with H. C. about the Method of proceeding in L. Mordant's Trial. Bill to explain the Poll Bill. Message to H. C. that the Lords will give them a Conference about the Method of proceeding in L. Mordant's Trial. Bill for suppressing Atheism, &c.
Report of the Conference concerning the Method of proceeding in L. Mordant's Trial. 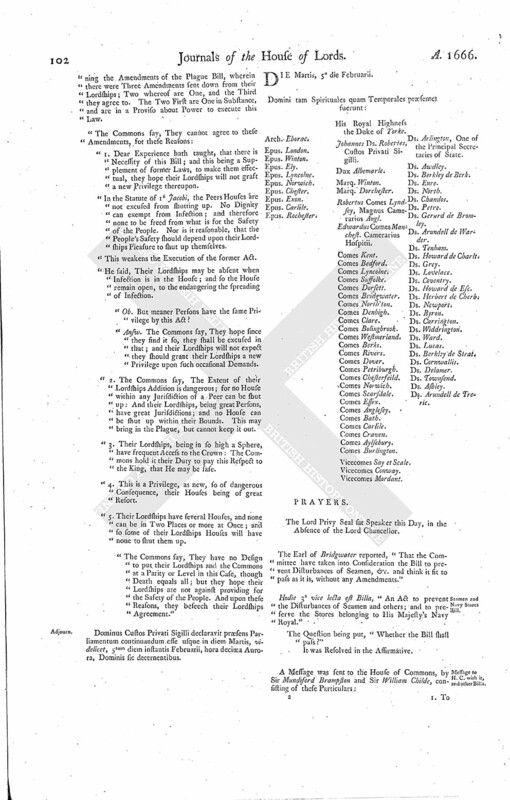 Resolution of the Lords upon the Report. Message to H. C. for a Conference about it. DIE Lunæ, 4 die Februarii, post meridiem. Seamen and Navy Stores Bill. Report of the Conference about L. Mordant's Trial. Report of the Conference concerning the Plague Bill. 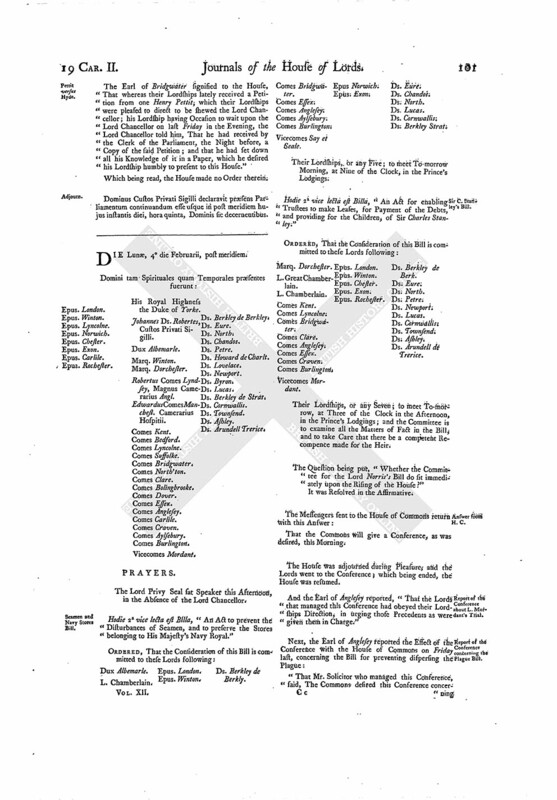 The Lord Chamberlain reported, "That the Committee of Privileges have considered of some Precedents concerning the Message from the House of Commons, concerning the Manner of Proceedings upon the Impeachment against the Lord Viscount Mordant; and their Lordships Opinion is, That none of those Precedents they have seen do come home to the Business; but the Precedents being ready, they leave it to their Lordships Pleasure, whether to peruse any of them." Primo Jacobi, 26 Maii; a Message from the House of Commons, concerning the Bishop of Bristol, who was complained of for writing a Book against the Union of England and Scotland; and Ultimo Maii, there was a Meeting between Select Committees of both Houses about the same; and 5th June, the said Bishop made an Acknowledgement of his Error, before a Committee of both Houses. Another Precedent was in 12° Jacobi, 28 May; a Message was (fn. 1) brought from the House of Commons, against the Bishop of Lyncolne, for some Words he spoke in the Lords House. The 4th of June, another Message was brought from the House of Commons against that Business. The Question being put, "Whether to grant a Conference with the House of Commons, upon the Desire of a late Message (fn. 2) from the House of Commons, concerning the Manner of Proceedings upon the Impeachment of the Lord Viscount Mordant?" "The Reason why we have desired the Leave of the Lords to enter our Dissents to the foregoing Vote is, because we believe the conferring with the House of Commons upon a Matter only relating to the Manner of Proceedings in Judicature, as we humbly conceive this to be, is a very great Derogation to the Privileges of this House. We do therefore enter our Dissents accordingly. "Dorchester. J. Bridgewater. Howard of Ch." The House was adjourned into a Committee of the whole House, to consider of the explanatory Act for raising Money by a Poll. The Lord Chamberlain reported, "That the Committee of the whole House have considered of the Bill explanatory for the Poll Bill, and thinks it fit to pass as it is." Hodie 3a vice lecta est Billa, "An Act explanatory for raising Monies, by a Poll and otherwise, towards the Maintenance of the present War." To let them know, that their Lordships are now ready to give them a present Conference, in the Painted Chamber, by a Committee of both Houses, touching their Message concerning the Impeachment against the Lord Viscount Mordant. ORDERED, That the Lord Privy Seal, Lord Chamberlain, Earl of Westm'land, Earl of Norwich, and the Lord Widdrington, are added to the Committee for the Bill concerning the Lord Norris; which Committee is appointed to meet this Afternoon, at Three of the Clock. 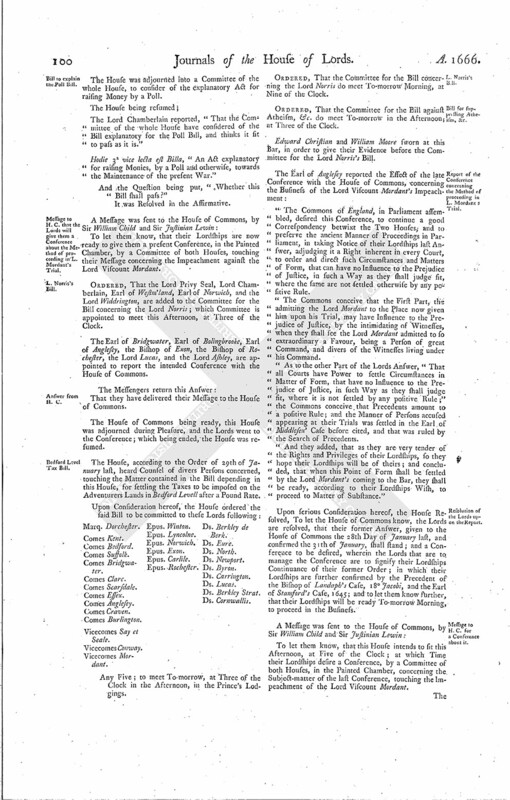 The Earl of Bridgwater, Earl of Bolingbrooke, Earl of Anglesey, the Bishop of Exon, the Bishop of Rochester, the Lord Lucas, and the Lord Ashley, are appointed to report the intended Conference with the House of Commons. The House of Commons being ready, this House was adjourned during Pleasure, and the Lords went to the Conference; which being ended, the House was resumed. The House, according to the Order of 29th of January last, heard Counsel of divers Persons concerned, touching the Matter contained in the Bill depending in this House, for settling the Taxes to be imposed on the Adventurers Lands in Bedford Levell after a Pound Rate. Any Five; to meet To-morrow, at Three of the Clock in the Afternoon, in the Prince's Lodgings. ORDERED, That the Committee for the Bill concerning the Lord Norris do meet To-morrow Morning, at Nine of the Clock. ORDERED, That the Committee for the Bill against Atheism, &c. do meet To-morrow in the Afternoon, at Three of the Clock. Edward Christian and William Moore sworn at this Bar, in order to give their Evidence before the Committee for the Lord Norris's Bill. 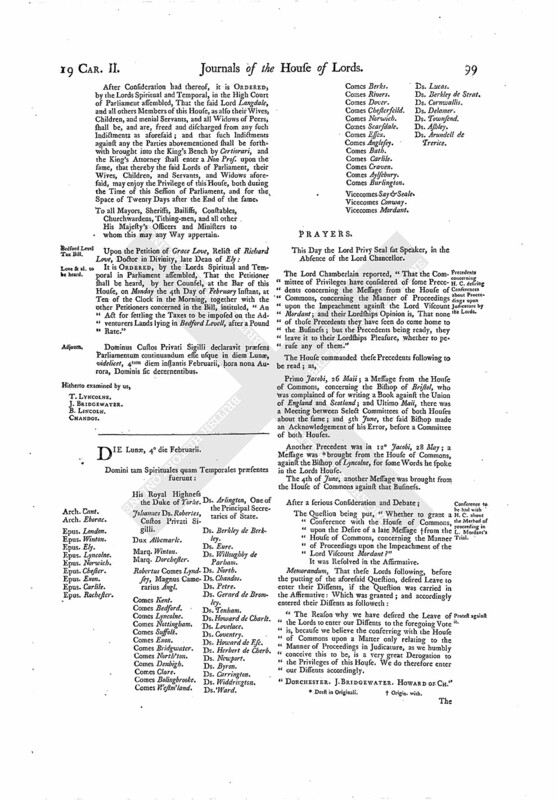 "The Commons of England, in Parliament assembled, desired this Conference, to continue a good Correspondency betwixt the Two Houses, and to preserve the ancient Manner of Proceedings in Parliament, in taking Notice of their Lordships last Answer, adjudging it a Right inherent in every Court, to order and direct such Circumstances and Matters of Form, that can have no Influence to the Prejudice of Justice, in such a Way as they shall judge fit, where the same are not settled otherwise by any positive Rule. "The Commons conceive that the First Part, the admitting the Lord Mordant to the Place now given him upon his Trial, may have Influence to the Prejudice of Justice, by the intimidating of Witnesses, when they shall see the Lord Mordant admitted to so extraordinary a Favour, being a Person of great Command, and divers of the Witnesses living under his Command. "As to the other Part of the Lords Answer, "That all Courts have Power to settle Circumstances in Matter of Form, that have no Influence to the Prejudice of Justice, in such Way as they shall judge fit, where it is not settled by any positive Rule;" the Commons conceive that Precedents amount to a positive Rule; and the Manner of Persons accused appearing at their Trials was settled in the Earl of Middlesex' Case before cited, and that was ruled by the Search of Precedents. "And they added, that as they are very tender of the Rights and Privileges of their Lordships, so they hope their Lordships will be of theirs; and concluded, that when this Point of Form shall be settled by the Lord Mordant's coming to the Bar, they shall be ready, according to their Lordships Wish, to proceed to Matter of Substance." Upon serious Consideration hereof, the House Resolved, To let the House of Commons know, the Lords are resolved, that their former Answer, given to the House of Commons the 28th Day of January last, and confirmed the 31th of January, shall stand; and a Conference to be desired, wherein the Lords that are to manage the Conference are to signify their Lordships Continuance of their former Order; in which their Lordships are further confirmed by the Precedent of the Bishop of Landaph's Case, 18° Jacob; and the Earl of Stamford's Case, 1645; and to let them know further, that their Lordships will be ready To-morrow Morning, to proceed in the Business. To let them know, that this House intends to sit this Afternoon, at Five of the Clock; at which Time their Lordships desire a Conference, by a Committee of both Houses, in the Painted Chamber, concerning the Subject-matter of the last Conference, touching the Impeachment of the Lord Viscount Mordant. The Earl of Bridgwater signified to the House, "That whereas their Lordships lately received a Petition from one Henry Pettit; which their Lordships were pleased to direct to be shewed the Lord Chancellor; his Lordship having Occasion to wait upon the Lord Chancellor on last Friday in the Evening, the Lord Chancellor told him, That he had received by the Clerk of the Parliament, the Night before, a Copy of the said Petition ; and that he had set down all his Knowledge of it in a Paper, which he desired his Lordship humbly to present to this House." Which being read, the House made no Order therein. Dominus Custos Privati Sigilli declaravit præsens Parliamentum continuandum esse usque in post meridiem hujus instantis diei, hora quinta, Dominis sic decernentibus. Vicecomes Mordant. Ds. Berkley de Berkley. The Lord Privy Seal sat Speaker this Afternoon, in the Absence of the Lord Chancellor. Hodie 2a vice lecta est Billa, "An Act to prevent the Disturbances of Seamen, and to preserve the Stores belonging to His Majesty's Navy Royal." Vicecomes Say et Seale. Epus. London. Epus. Exon. Ds. Berkley de Berkly. Their Lordships, or any Five; to meet To-morrow Morning, at Nine of the Clock, in the Prince's Lodgings. Hodie 2a vice lecta est Billa, "An Act for enabling Trustees to make Leases, for Payment of the Debts, and providing for the Children, of Sir Charles Stanley." Their Lordships, or any Seven; to meet To-morrow, at Three of the Clock in the Afternoon, in the Prince's Lodgings; and the Committee is to examine all the Matters of Fact in the Bill, and to take Care that there be a competent Recompence made for the Heir. The Question being put, "Whether the Committee for the Lord Norris's Bill do sit immediately upon the Rising of the House?" That the Commons will give a Conference, as was desired, this Morning. And the Earl of Anglesey reported, "That the Lords that managed this Conference had obeyed their Lordships Direction, in urging those Precedents as were given them in Charge." "That Mr. Solicitor who managed this Conference, said, The Commons desired this Conference concerning the Amendments of the Plague Bill, wherein there were Three Amendments sent down from their Lordships; Two whereof are One, and the Third they agree to. The Two First are One in Substance, and are in a Proviso about Power to execute this Law. 1. Dear Experience hath taught, that there is Necessity of this Bill; and this being a Supplement of former Laws, to make them effectual, they hope their Lordships will not graft a new Privilege thereupon. In the Statute of 1° Jacobi, the Peers Houses are not excused from shutting up. No Dignity can exempt from Infection; and therefore none to be freed from what is for the Safety of the People. Nor is it reasonable, that the People's Safety should depend upon their Lordships Pleasure to shut up themselves. This weakens the Execution of the former Act. He said, Their Lordships may be absent when Infection is in the House; and so the House remain open, to the endangering the spreading of Infection. Ob. But meaner Persons have the same Privilege by this Act? Answ. The Commons say, They hope since they find it so, they shall be excused in that; and their Lordships will not expect they should grant their Lordships a new Privilege upon such occasional Demands. "2. The Commons say, The Extent of their Lordships Addition is dangerous; for no House within any Jurisdiction of a Peer can be shut up: And their Lordships, being great Persons, have great Jurisdictions; and no House can be shut up within their Bounds. This may bring in the Plague, but cannot keep it out. "3. Their Lordships, being in so high a Sphere, have frequent Access to the Crown: The Commons hold it their Duty to pay this Respect to the King, that He may be safe. "4. This a Privilege, as new, so of dangerous Consequence, their Houses being of great Resort. "5. Their Lordships have several Houses, and none can be in Two Places or more at Once; and so some of their Lordships Houses will have none to shut them up. "The Commons say, They have no Design to put their Lordships and the Commons at a Parity or Level in this Case, though Death equals all; but they hope their Lordships are not against providing for the Safety of the People. And upon these Reasons, they beseech their Lordships Agreement." Dominus Custos Privati Sigilli declaravit præsens Parliamentum continuandum esse usque in diem Martis, videlicet, 5tum diem instantis Februarii, hora decima Aurora, Dominis sic decernentibus.